Liberia is a low income country heavily reliant on foreign assistance for revenue. Civil war and government mismanagement destroyed much of Liberia's economy, especially the infrastructure in and around the capital, Monrovia. Many businesses fled the country, taking capital and expertise with them, but with the conclusion of fighting and the installation of a democratically-elected government in 2006, several have returned. 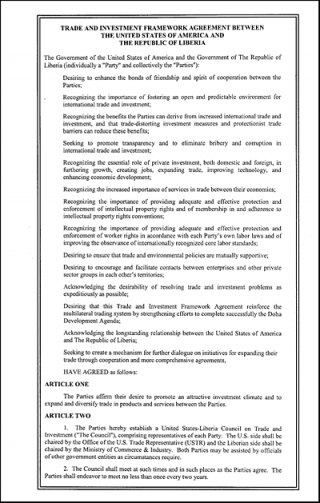 Liberia has the distinction of having the highest ratio of direct foreign investment to GDP in the world. Richly endowed with water, mineral resources, forests, and a climate favorable to agriculture, Liberia had been a producer and exporter of basic products, primarily raw timber and rubber and is reviving those sectors. Local manufacturing, mainly foreign owned, had been small in scope. President Sirleaf, a Harvard-trained banker and administrator, has taken steps to reduce corruption, build support from international donors, and encourage private investment. Embargos on timber and diamond exports have been lifted, opening new sources of revenue for the government and Liberia shipped its first major timber exports to Europe in 2010. The country reached its Heavily Indebted Poor Countries initiative completion point in 2010 and nearly $5 billion of international debt was permanently eliminated. 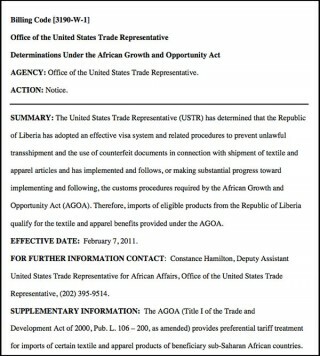 This new status will enable Liberia to establish a sovereign credit rating and issue bonds. Liberia's Paris Club creditors agreed to cancel Liberia's debt as well. The IMF has completed the sixth review of Liberia's extended credit facility, bringing total disbursements to over $379 million.